Our Cupcakes store well at room temperature, unless the weather’s really hot! In that case do refrigerate, but best if brought back to room temperature before consuming. As for all baked goods, Cupcakes are at their best the day they’ve been baked, but still as yummy for up to 3 days. Our Cupcakes come in neat boxes with inserts for your convenience and to hold them in place, but please treat them kindly or they can still flip. Not a good idea to have your child carry them home! 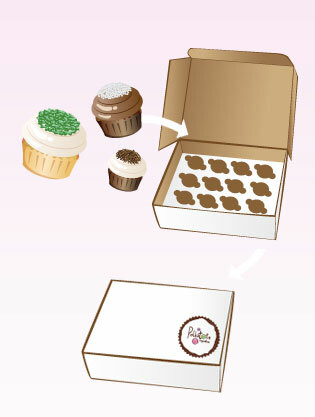 For easy clean removal, pop underneath each Cupcake on the Mini containers. For the Biggies you can disassemble the box and push underneath too. If you love licking your fingers, simply grab the cupcakes from the top. This is always an option! And finally, Enjoy, Pig Out and Have Fun!